Each site you add to your Hotjar account will have its own unique Tracking Code to install. In order to install the Tracking Code, you can either follow one of our platform-specific guides, or you can manually install the Tracking Code. If you are using one of the below platforms, we recommend referring to the installation guide for for step-by-step instructions. If you prefer to install the Tracking Code manually, or if your specific platform is not listed above, follow the below instructions. Check if your platform is compatible with Hotjar. If you aren’t sure if your platform can be used with Hotjar, you can check out our guide on Platforms and Frameworks Not Compatible with Hotjar. Go to your Sites list and click on the Tracking Code button for the Site you want to track. Click on Copy to Clipboard. Paste the Tracking Code into the <head> section of your website. Hotjar works most accurately if the Hotjar Tracking Code is in the Head tag (<head>) of every page you want to track on your site. We recommend adding the Tracking Code to your website template so that it automatically goes into each page of your site. Check your Hotjar Site Dashboard to verify the installation. Once you have added the Hotjar Tracking Code to your site, you will need to wait a few minutes for Hotjar to check if it is installed correctly. This usually happens the moment your site is loaded with the Hotjar code on it, but there can be a delay before it shows as "Active". For more information and methods to verify your Tracking Code, check out How to Verify Hotjar is Installed. If your website undergoes a major design change after you install the Tracking Code, check to ensure your Tracking Code is still installed. Design changes may cause the Tracking Code to be removed, which will prevent Hotjar from collecting data. 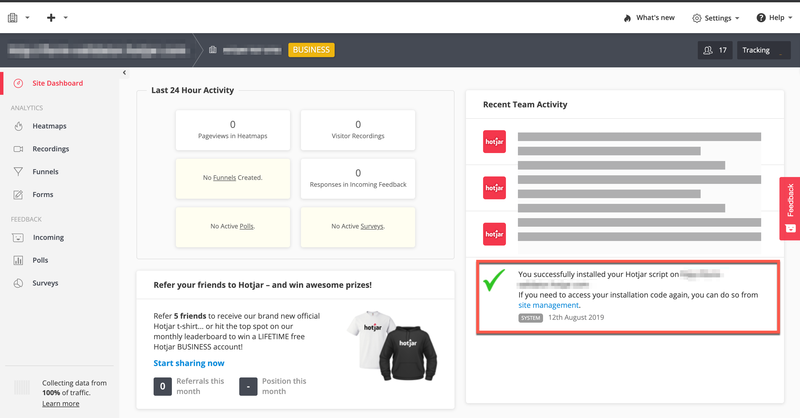 Once you've successfully added the Tracking Code to your site, you are ready to start using Hotjar! We recommend you start setting up Heatmaps, Recordings and Incoming Feedback. You can verify the installation manually by following these steps or reach out to our support team so we can help you!